Water, methane, organic compounds, Twinkies, Amelia Earhart’s plane… there’s just so many cool things for Curiosity to find on Mars! 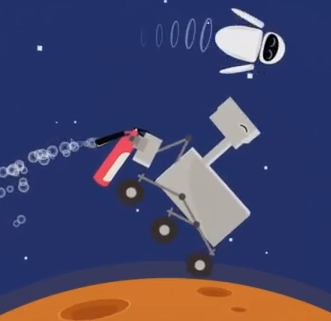 This little production by Seattle-based Cinesaurus may be a parody of “Dumb Ways to Die” but there’s certainly nothing dumb about the exciting things that Curiosity’s already found in its brief time in Gale Crater… and there’s undoubtedly lots more to come. So enjoy the video, let your own imagination roam — er, rove — and keep an eye out for facehuggers. They’re tricky! Next Post Hidden Ice Found on Mercury! Both are great videos! I love them.